A spinal tumor put Shingo in wheelchair when he was 9. Two years later, his mother introduced him to wheelchair tennis. At that time, he enjoyed more playing basketball with his non-handicapped schoolmates, and that helped him to develop the excellent control of wheelchair, which is now his biggest weapon. Kunieda started showing his ability in high school and went abroad, and was shocked to see the difference of the levels between Japan and the world's wheelchair tennis. After that, Shingo started training under Hiromichi Maruyama to become a competitive player. 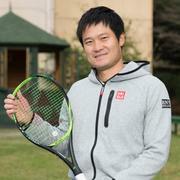 At 2004 Paralympic Games in Athens, Shingo teamed up with Satoshi Saida and won the gold medal in doubles. After he won US Open in October 2006 - his second Grand Slam title - Shingo became the first World No. 1 as an Asian. In 2007, the first Asian World-No. 1 achieved the same-year Grand Slam, winning all 4 Grand Slam events for wheelchair at that time, for the first time in the history of wheelchair tennis. At 2008 Paralympics in Beijing, Kunieda won Gold in singles and Bronze in doubles. In 2009, wheelchair tennis' Grand Slam became the same events as non-handicapped. In the same year, he won Australian Open (for 3 consecutive years) and declared to become professional wheelchair tennis player, the first in Japan. He won Japan Open 4 consecutive times and French Open 3 consecutive times. At doubles-only Wimbledon he lost in the final (w/ Ammerlaan). Shingo also won US Open 2 consecutive times (not held in 2008 for Olympics). In 2010, he won all 3 Grand Slam singles, Australian Open, French Open and US Open. He was nominated for the 2010 World Sportsperson of the Year with a Disability for the Laureus World Sports Awards, which is called Academy Awards for sports. Kunieda won 107 consecutive singles games before he lost at Masters in November. He became World No. 1 for 4 years in a row for the first time as a male wheelchair tennis player. Shingo again won Australian Open and US Open singles in 2011. He could not play for a while due to an elbow injury he suffered at US Open but came back at Japan Open in May 2012. He became the first man to win gold medals in 2 consecutive Paralympic Games in London in September. In 2014 he achieved the same-year Grand Slam for the 4th time after 3 years and was given the award for superb work of professional athlete by the Ministry of Education, Culture, Sports, Science and Technology of Japan. With "I am the best!" as his motto, Kunieda has established himself in an overpowering position in wheelchair tennis. He worked as an ambassador for 2020 Tokyo Olympic/Paralympic campaign, and is expected to be a key person to promote all sports for people with disability. Shingo himself has declared to get in and win gold not only at Rio de Janeiro Paralympics in 2016, but also in Tokyo 2020 and keeps playing. *Since 2009, non-handicapped Grand Slam events became the wheelchair Grand Slam.